NE Wisconsin... Contact me if you're outside my area to discuss travel. I work on a reward basis, that means you pay what it's worth to you and what you can afford to have me find your lost item. I do have a small call out fee if the item is not found. This covers my fuel expenses. We can discuss this when you call. I would love to help you find your lost item. Anywhere on Land. I also have a waterproof metal detector and can search up to 5 feet of water. In some areas there may be special land owner permissions required. Contact me and we can discuss those details. I was first introduced to metal detecting while serving in the US Army doing protective sweeps for things that go BOOM. 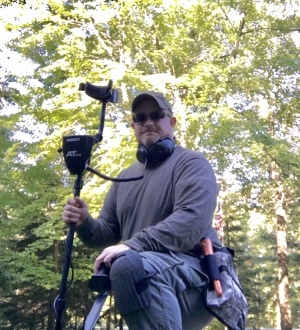 I purchased my first metal detector, as a hobbyist, in 2010 and the rest is history! I have 7+ years of detecting experience finding countless coins, jewelry pieces, lot line pins, and historic relics. I also have experience in gold prospecting and have my own pans and a gold sluice. ** For Law Enforcement - I have a 23 year career in law enforcement and I'm currently a certified full-time Police Officer/Investigator/Evidence Custodian in the State of Wisconsin. I have extensive training in evidence detection, preservation, handling, and collection. Contact me and let me know if I can assist you in any way. Went searching for history at a local homestead site in Shawano County, WI. Came across what I believe to be a WWII Army General Staff button. It was about 6 inches down.